How do I get started in Forex? The ‘Samsung L830’ has 8.1 mega pixels, and the L730 has 7.2 mega pixels, and they both have a 3x optical zoom. The Samsung L series, the leader in the high quality digital camera market, has evolved to become more stylish, with its metal front cover and minimalist design concept. With the Samsung exclusive Multi Charge system that has been adopted in the Samsung L830/L730, recharging and data transmission can be done at the same time by connecting a combined recharging and USB cable. 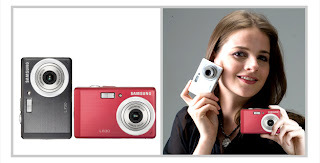 Without a heavy charging unit or cradle, the Samsung L830/L730 claims to be the easiest digital camera to carry around with you. - The L830/L730 is ideally suited for family gatherings such as picnics, school exhibitions or trips, with all its extra functions such as Face Recognition (AF & AE) and Red-eye fix. The Face Recognition (AF & AE) function recognizes individuals and takes the best portrait, while the Red-eye fix takes care of the red-eye phenomenon during and after shooting. - The Mode Dial of the ‘Samsung L830/L730’ enhances ease of use when operating the camera with only one hand. Photo frames, cartoons and stickers add more fun to taking pictures. - The ‘Samsung L830/L730’ has a powerful movie function using MPEG4, an SVGA level resolution (800ⅹ592), and is equipped with both an editing capability and a variety of image viewing functions.